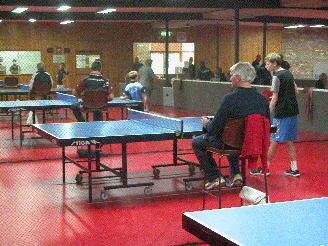 The Latrobe City/Traralgon Table Tennis Stadium houses 10 fully netted courts with quality competition table tennis tables. In addition to the main stadium we have the newer International Wing housing 4 International Competition sized courts. Both stadiums are fitted with seating for spectators. Along with kitchen and amenities rooms there is a kiosk selling snacks and cold drinks. At the kiosk you can purchase a variety of table tennis equipment including a range of quality branded bats or inquire about having a bat designed to meet your specific needs. You can also purchase a competition standard Table Tennis table. We are a not for profit organisation and can offer our membership quality goods at exceptional prices. Click HERE to visit our catalogue page for equipment.